An expansive set of rules and scenarios. Stood the test of time. Admittedly, I've never played tabletop 2nd edition. But I've played enough of the old computer games that I feel I can rate the rule-set. 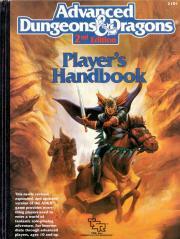 It was good, especially for its time, even though I prefer the 3E rules. AD&D was responsible for turning me on to the magic of D&D. I've always preferred the campaign worlds of AD&D2E to the more modern stuff. They have a gravitas and verisimilitude to them that's missing from later installments.